We have been having a ball all week long swapping product with Xyron. Have you seen the darling projects they've been featuring all week. If not, be sure to check out their blog. Also, we love giving away fun prizes, so be sure to scroll to the end of this post. 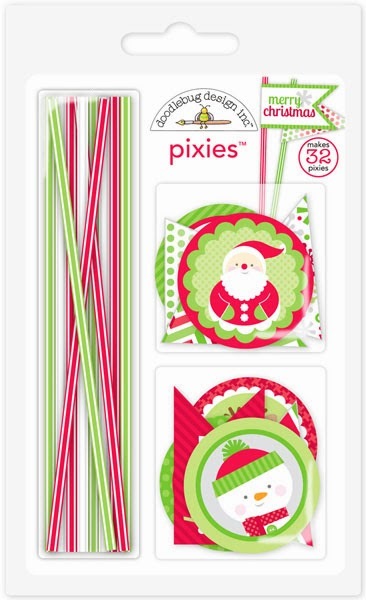 Now for some holly jolly Christmas fun with our Home for the Holidays Pixies. Cut into pieces, Pixies can make just about any shape. 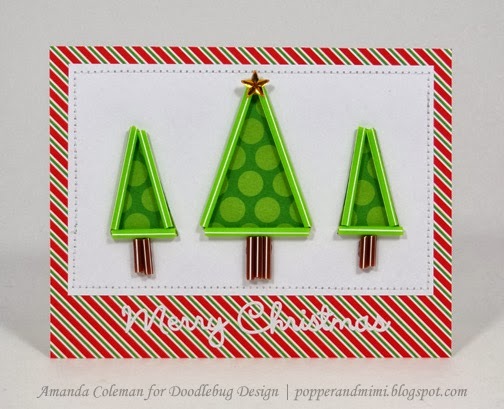 To make the Christmas trees, I trimmed green Pixies and adhered them to patterned paper and then cut out the shape. I used three different colors and attached them as a border. To make things even easier, I made sure that the height of the patterned paper was the same as the Pixies...no trimming needed! I chose to use white sequins for the snow, but you could replace these with small snips of white Pixies. I'm looking forward to finding even more creative ways to incorporate these fun embellishments! We'll be giving away a set of the new Home for the Holidays Pixies and Toppers (shown above). Go over the Xyron Blog and then leave a comment HERE telling us what project today you like the best! We'll announce the Doodlebug winner tomorrow on the blog and offer a new giveaway. And don't forget to stop by the Xyron blog to enter to win some fun adhesive products. Totally creative and clever!! Love it! I love the shadow box idea on the Xyron blog. It's so cute with all that Doodlebug, plus the fact that you can change out the photos and embellishments is so cool. Love the use of sequins for snow !! I liked the shadow box on Xyron blog because of the clever use of magnetic tape so that the layout can be changed easily....increases the life of the project with such a clever idea !! Thanks for a chance to win the amazing goodies !! Love the shadow box idea, such beautiful creativity and genius idea!!! Just saw all the great layout pages by Wendy and Jodi using the pixies - love them. Shellye's card is totally cute too. the trees look like they are lit with neon. the pixies will be fun to play with. If you want a favorite project from the Xyron blog, I love the recycled tea boxes - especially the Santa one. It is so bright and colorful. I love the upcycled box done by Yvonne Tang - it turned out so stinking cute!! Love all the details on ot that make it say "WOW"!! I love the shadow box by Van Nguye. That is so beautiful!! I love the trees! Such a cute idea! Loved the shadow box over at Xyron. Fun ideas with the Pixies! I love Gini's cute card with the bow! I have another opportunity to win!, is fantastic, for me the most beautiful projects is the shadow box, because is so cute! I love the Christmas gift box on the Xyron blog. I love the cards on here too! Loving the sequins. All such cute projects! Thanks for the ideas and inspiration!!! I really like Yvonne's gift box! I love the card with Santa and the cute red bow!! Love the Christmas tree card and the shadow box. What wonderful projects! On the Xyron blog, love the shadow box with its interchangeable fronts! I love the trees outlined with the pixies, so cute! I thought the Christmas gift box was pretty on the Xyron blog. On the Xyron blog I like the altered tea box. Here I like the tree card. 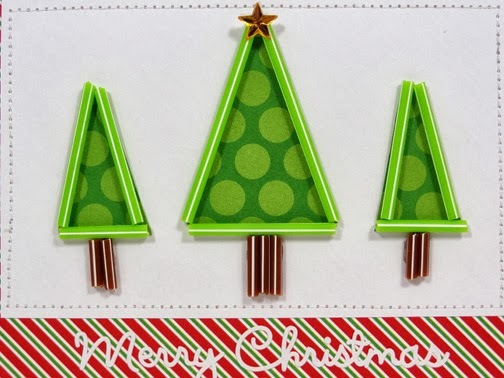 Love the Christmas trees card. fun projects! thank you for sharing! Van's Shadow Box is awesome but then again I am loving all of the Doodlebug projects. The colors rock! I pinned the cards on Pinterest. the trees look like they are outlined in neon. The trees are so creative. Love them! The shadow box is totally awesome, what a great idea!